This apparatus is made as per IP 34, ASTMD-93 and IS 1448 (Part I) 1270 (P.21) and IS 1209-1953 method B. Used for finding out Flash Point above 70°C and below 300°C. 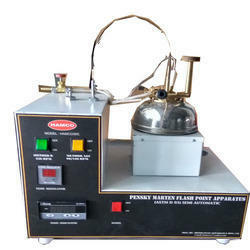 The having Oil Test Jet / Gas Test Jet flammable device, stirrer with flexible shaft. The Assembly rests in Air Bath which is covered with Dome shape metal top. Semi automatic PMCC flash point instrument.Fully automatic PMCC flash point instrument as per ASTM D93 available at best price. Specification: With Heating Unit, Sand Distributor Digital Temperature Indicator And Controller, Brush. 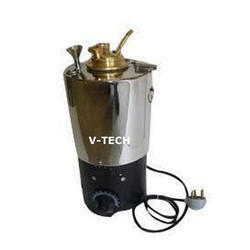 USE: It is use to determine melting point of Resin Coated Sand. For determining the flash & fire points of petroleum products except oils and products having an open cup flash below 1750 F.